“April 30, 1911. Last September we had an exposition at the old county fairgrounds. One of the out-of-door attractions was Capt. Albers 14 trained polar bears. I snapped this from the grandstand across the racetrack while they were ‘shooting the chutes.’ This negative is a trifle thin. Write again soon.” This is the note on the reverse of today’s Real Photo postcard. The darkness of the photo is a result of the thin or mostly transparent negative. As we looked further into this postcard from Shannon Hall’s collection, we learned many things. First of all, the old County Fairgrounds, one block wide and four blocks long, was located on the south side of 18th Avenue between 5th and 9th Streets, catty corner from what is now Douglas Park. In May of 1867, the Argus noted the development of a County Fair company and the fairgrounds “on the prairie” west of the Jonah Case farm, about a mile south of the courthouse on Camden (as Milan was then known) road. The 35 acre parcel was immediately improved with the addition of a 9-foot fence and new wells. By the opening of the first fair in September, 1867, there was an octagonal ticket office, a two-story caretakers house, an open arcade 40 feet square, a ladies “reception” building, and a large octagonal “floral hall” surrounded by open porches and encompassing a 70-foot observatory. An amphitheatre 304 feet long held ten tiers of seats on the half-mile oval trotting course. It was noted that the only defect in the site was the lack of trees, which were to be planted. For at least a decade thereafter, a fair was held each autumn. But by the early 1900s, the fairgrounds were closed and the oval track was leased to a racing association. In 1904, a group of businessmen organized to reopen the old fairgrounds. They also acquired arranged to lease 15 acres of land north of 18th avenue from the Weyerhaeuser Company, but whether that parcel was used is not known. Access to the original fairgrounds was negotiated, improvements were made, and Exposition Park was opened, with the first annual fair held in September, 1908. In 1909, a contract to build a new bandstand at the park was awarded to Henry W. Horst. 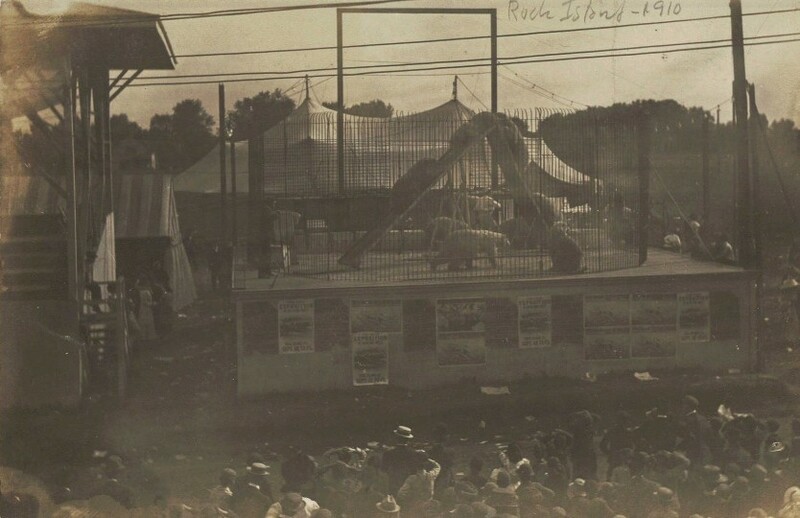 Among the featured attractions were the daily horse races, Aroki’s Japanese troupe of jugglers, European burlesquers, evening fireworks, and, of course, Herr Albers’ performing polar bears. Albers’ act, which was featured in an Exposition program, put ten trained polar bears through their paces. Perhaps it just seemed like 14. The bears are young, since Herr Albers was photographed carrying one on his shoulders while several others of similar size are in the background. A mature polar bear can weigh well over 1000 pounds. But the real hit of the Exposition was the airplane. People came from 100 miles away to see the planned twice daily demonstrations of a Glenn Curtiss-made airplane flown by 24-year old Curtiss aviator Eugene H. Ely. Ely was said to be “one of the most successful man-birds in America.” Moreover, he was a hometown boy, born in Williamsburg, Iowa, in 1886 and moving with his parents as a young boy to Davenport where he grew up and was educated. His fascination with mechanized transportation began here with racing autos. In 1904, leaving his parents and friends, he moved first to California and later to Oregon as an auto racer. Less than a year before this exposition, he acquired a Curtiss “pusher” airplane and taught himself to fly. Soon after, Ely met the plane’s maker, Glenn Curtiss, and almost immediately became an official member of the Curtiss flying team. The plane he flew was similar to today’s experimental ultralight aircraft, looking like a conglomeration of folding lawn chairs on bicycle wheels with lashed canvas panels creating fragile wings. The pilot was seated in front of the engine and propeller, completely exposed and unprotected. While in Rock Island, Ely announced he would try to set new altitude and speed records. But there were problems. On the first day bad weather caused him to hit a fence on takeoff and break his propeller. He repaired the plane and by Wednesday, was in the air for 8 minutes covering an estimated 5 miles. Viewers said he started at the east end of the field, made a 100 yard run, then tipped the rudder upward and the plane rose. When he landed, he shut off the engine at a 400 foot altitude and simply coasted in. On Thursday, 7000 people were on hand to see Ely airborne for 12 ½ minutes. A reported 152 cars were outside the fairgrounds as well, with 90 percent having Iowa tags. It was claimed that those who drove (rather than taking the streetcar) wanted to avoid the 50 cent admission and instead stood up in their autos to view the flying show. Ely was the hero of the exposition and he soon became a national maritime hero as well for demonstrating the feasibility of naval aviation by making the first landing and takeoff on a ship. On November 14, only two months after his Rock Island appearance, he took off from a temporary platform erected over the bow of the cruiser Birmingham. The following January, he landed his plane on the cruiser Pennsylvania and, after a brief visit on the ship, took off and returned to shore. The feat brought Ely front page fame. His enjoyment of that glory was short lived. Nine months later, just short of his 25th birthday and a year after appearing in Rock Island, Ely died when his fragile plane crashed during an air show in Georgia. His achievements were recognized posthumously with a Distinguished Flying Cross. As for Exposition Park, it continued in use through 1916 when the Fort Armstrong Centennial was celebrated there. But a year later maps show the four square block site platted as the Exposition Park residential subdivision. Surely today, hidden beneath the new homes and gardens, there are remnants and memories of a half-mile racetrack, of glorious fair buildings, of polar bears and burlesquers, and even wood splinters from a hero’s broken propeller. This article by Diane Oestreich is slightly modified from the original, which appeared in the Rock Island Argus and Moline Dispatch on March 21, 2004. NOTE: Eugene Ely’s career is covered in a series of Argus/Dispatch articles that appeared in 2004.